CFIBWC Board members are nominated and elected by governing board and membership. Members serve for two years and are eligible for re-election. Executive Director is an appointed position by the Board members based on qualification, experience, and commitment. All Board meetings held monthly on the second Saturday the month, from 10:00 a.m. to 11:30 p.m., unless otherwise noted. No meetings are held in July and August. 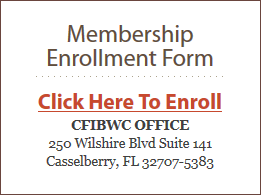 The CFIBWC serves Lake, Orange, Osceola, and Seminole counties.